The Defender® TV Aerial Pack is a specifically designed pigeon deterrent that can be fixed to any aerial or satellite dish which suffers from perching or roosting birds and pigeons. When birds land on an aerial, they can move it out of position or, at worst, damage it, which in turn can disrupt your viewing, and satellite dishes and TV aerials are not easy to put right or cheap to replace. Due to the fact that no two aerials or satellite dishes are the same, the Defender® TV Aerial Pack comes with 3 different fixing solutions, one of which will be perfect for your bird control problem and enable you to deter the birds from your property. It is also made entirely of plastic which means, once installed, it will not interfere with the signal. All our Defender® spikes are made by us, Jones and Son Pest Control Supplies, in Devon. If you are visiting the west country and have a pigeon deterrent question, call in to chat with our friendly advisers and learn how our spikes are made. The Defender® TV Aerial Pack comes in 2 different sizes, large and small, to cater for the many varying shapes and sizes of aerials and satellite dishes on homes and businesses that need to deter pigeons. The Defender® Small TV Aerial Pack contains 9 strips of Wide Plastic Pigeon Deterrent Spike. Each strip is 33.4 cm or 13 inches in length. That amounts to 3 linear metres of bird spike which can be fixed along the main central pole and the branches that come off the aerial. All the fixings are included to accommodate this amount of pigeon deterrent spikes. 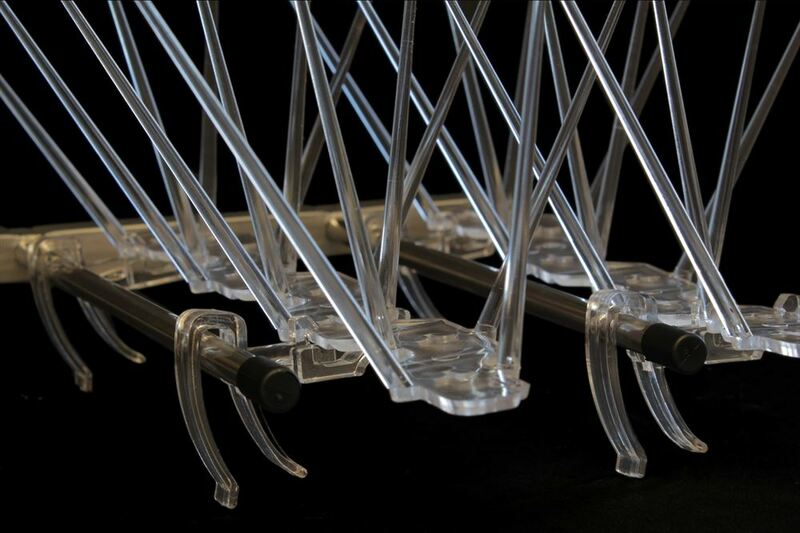 The large Defender® TV Aerial Pack contains 18 strips of Wide Plastic Pigeon Deterrent Spike. This amounts to 6 linear metres of bird spike. This larger pack can be used for several smaller aerials or satellite dishes or of course, the large industrial sized aerials. The Defender® TV Aerial Pack is made up of components that are entirely polycarbonate plastic. This is to ensure that, once fitted to your aerial or satellite dish, there will be no disruption to your signal. The pigeon deterrent spike used in this TV aerial pack is the Defender® 8 Wide Plastic Pigeon Spike. This pigeon control spike comes with a 15-Year Warranty as the UV stabilised polycarbonate plastic from which it is made is a super-tough compound that stands up to all extreme weather systems. Included in the TV Aerial Pack are clips and cable ties, again made to survive many years of being outside and manufactured from the same UV stabilised plastic, also proven not to upset your viewing signal while the spike deters pigeons from your aerial. Along the base of the plastic pigeon deterrent spike are breakable sections that can simply be snapped apart with your fingers - this means the pigeon spike can easily be adjusted to fit the length of the TV aerial branches exactly. The Defender® Aerial Packs come with the necessary amount of aerial clips needed to attach the wide pigeon deterrent spikes to your aerial or satellite dish. They are made from the same UV stabilised polycarbonate plastic as the pigeon spikes, and therefore will last many years without yellowing or becoming brittle. They are simply clipped attached to the base of the spike and then clipped onto the aerial branches. 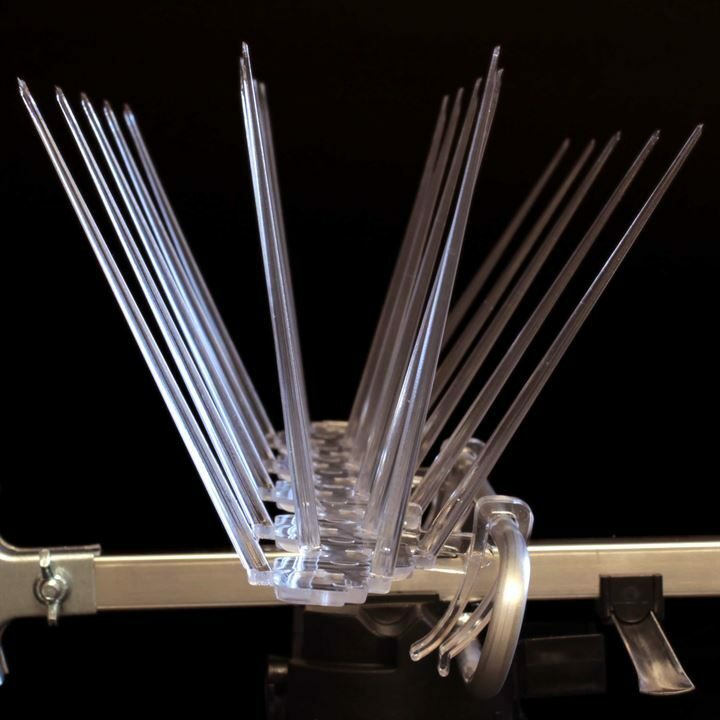 If the preferred method of attaching the Defender® Plastic Pigeon Deterrent Spikes to your aerial is with cable ties, it is very straightforward. Just tighten the cable tie over the base of the spike and aerial and pull tight to prevent slippage. The tube of fixing silicone can be used to stick the pigeon deterrent spikes directly onto the aerial or satellite dish. It can also be used in conjunction with the aerial clips or cable ties to ensure a super-secure fit. All the plastic pigeon spikes included in the Defender® TV Aerial Pack are a recognised humane method of deterring pigeons. The plastic pigeon deterrent spike has pins which fan out, making it uncomfortable for birds or pigeons to land and perch on TV aerials or satellite dishes. They will then move on to another more accessible perch. There are 3 different methods included in the TV Aerial Pack designed to deter pigeons from perching on aerials and satellite dishes. The first is to attach aerial clips to the base of the pigeon deterrent spike and clip it onto the aerial directly. Just ensure the clips are facing the same way. Another method is to use cable ties to tighten the pigeon spikes onto the aerial. 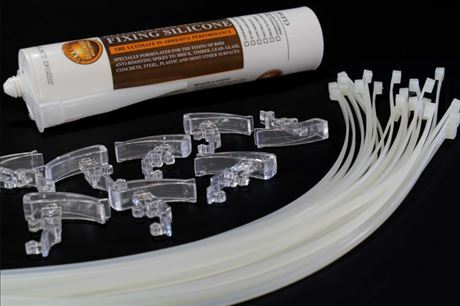 Lastly, the Defender® Fixing Silicone can be used to glue the spikes into position. All 3 methods can be used in conjunction with each other to ensure a strong fixing. The Defender® 8 Wide Plastic Pigeon Spike is made from super tough Durolon UV stabilised polycarbonate. This ensures the spikes suffer no degradation due to the adverse effects of extreme weather. They do not yellow or become brittle and can withstand low and high temperatures. Therefore they come with a 15-Year Warranty. The aerial clips are also made from Durolon and are covered by this Warranty, while the Defender® Fixing Silicone is UV stabilised and has a life expectancy of 35 years. As the components of the Defender® TV Aerial Pack are made from UV stabilised polycarbonate plastic, they ensure that this spike and clips will not become brittle in direct sunlight or adverse weather conditions. The pack comes with a Product Warranty of 15 years for extra peace of mind, and will protect your property for years to come. As an aerial or satellite dish tends to be exposed to all extremes of weather, it is imperative that the pigeon deterrent product can withstand very low and high temperatures to deter pigeons and other birds from perching on your TV aerials. Defender® TV Aerial Packs are designed and manufactured by Jones and Son Pest Control Supplies Ltd, using the highest quality materials to ensure the customer has a working product that gives total confidence in its ability to deter pigeons and other similar sized birds. Our Defender® TV Aerial Pack has been installed successfully by many people and has kept pigeons and birds away from aerials and satellite dishes. Read TV Aerial Plastic Pigeon Deterrent Spike Reviews.